The Gay Ottawa Volleyball (GOV) league hosts a number of events throughout the year. This includes weekly socials, fundraisers, our annual holiday party and annual tournament and gala. Every September after labour day weekend, we have an opening season get-together, where you can register for our programs and mingle with fellow players. After each night of volleyball, we welcome all players to join us at the Lieutenant’s Pump for food, drinks, socializing and free nachos! Teams can also pick up their “Pump Bucks” card and start collecting stamps towards food at the end of the season. 10 “bucks” per week (equivalent to $10 in Pump food), and if you come every week in the season your “bucks” double! That can add up to a lot of food for your team at the end of the year. 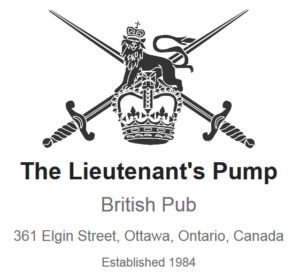 The Lieutenant’s Pump is located at 361 Elgin Street, Ottawa, ON. Each spring we throw a little celebration to mark the end of the indoor volleyball season in the spring. It is free for members and $5.00 for guests. There is always lots of food and snacks for everyone. We host and support a number of fundraisers throughout the year. This includes Euchre Tournaments, Bottle Drives, Trivia nights, and more. Each year we host a holiday party which is free for members and $5.00 for guests. There is always lots of food and snacks for everyone. Every year, usually in the spring we host a 2-day volleyball tournament. The tournament includes both competitive and intermediate divisions, with teams traveling from all over to compete! And we throw a fabulous party on the Saturday night!